This Sun Dried Tomato Quinoa Salad is amazingly flavorful and has a the perfect blend of textures. 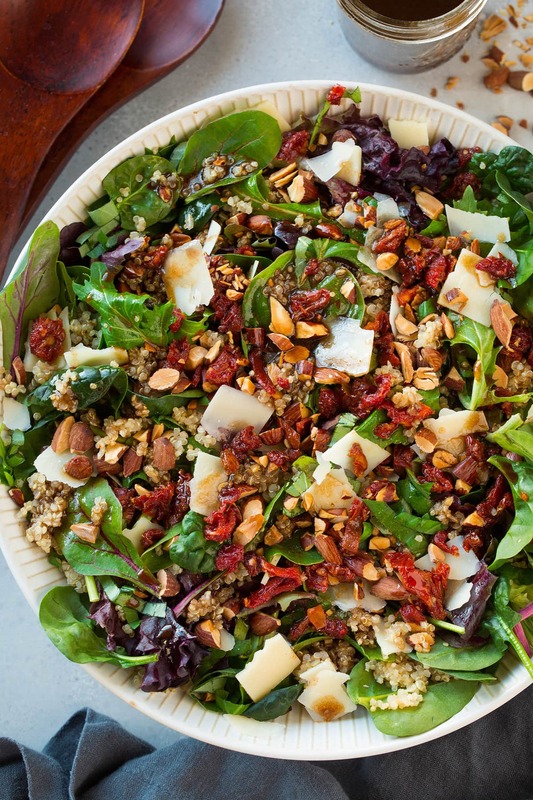 You get a layer of tender spring lettuces, hearty quinoa, crunchy toasted almonds, bold parmesan, chewy bright sun dried tomatoes and a final finish of a tangy, rich balsamic vinaigrette. So much goodness in one super satisfying salad! It's been far to long since I shared a salad recipe here. It seems as though I've shared every kind of salad out there but I've been missing a sun dried tomato salad. I love those shriveled little bits of sun kissed tomatoes, they might be small but they pack a lot of exciting gourmet flavor. They pair perfectly with this mellowly sweet and tangy balsamic dressing and the nutty quinoa and almonds. This is the perfect side dish for dinner but it also makes a nutritious and filling lunch, with or without chicken added.